reason behind the decriminalisation of recreational and medical marijuana? It said the ban was in contradiction to its constitution which gives citizens the right to privacy. But what does this mean to us? And more importantly, with South African Courts legalizing marijuana does this change anything when it comes to how we should view the plant in terms of addiction? Well, sort of. Let’s first take a look at the business side of things. Marijuana is widely cultivated across South Africa for both domestic use and export. A recent report by the US State Department revealed that South Africa is a large source of herbal cannabis for the United Kingdom and continental Europe. In KwaZulu-Natal, a strain of marijuana called “Durban Poison” has been rated among the “20 greatest marijuana strains of all times”, by the US cannabis publication High Times. So people all over the world know of and purchase the drug. It is important to also note that while law enforcement views marijuana industry sale as an “illegal drug trade”, cultivation of cannabis / marijuana is an important cash crop for South Africans rural communities, particularly in Cape Town, Eastern Cape and KwaZulu-Natal provinces. The court ruled legalisation of private use of marijuana does not change the marijuana legal global outlook on it from a sales perspective and it is still widely prohibited in most countries. It has been legalised for recreational purposes in Canada, Georgia, Uruguay, and 29 states in the United States of America. In many countries, particularly Spain and the Netherlands, a policy of limited enforcement has been adopted. We know there is much to be gained from the use of hemp (a by-product from the plant) in terms of clothing and other materials, but what are the implications from a health perspective? Effects of Cannabis What does it do? Marijuana is used for the feeling of relaxation that follows any kind of consumption. The feeling doesn’t last that long (two to three hours) and the intensity varies according to the person, the atmosphere, the size of the dose, and the blend. Not all of the side-effects are pleasant, however, especially when it’s consumed in high doses. Marijuana can be addictive. About 10% of all personal consumption users seem to develop dependence syndrome, and for those who start in adolescence, the number is more like 1 in 6. Marijuana use is linked to adverse cognitive effects. In particular, the drug is linked to reduced learning, memory, and attention. Marijuana may change brain structure and function. There’s been an ongoing debate about whether marijuana actually changes the brain, but recent evidence has suggested that it is linked to changes in the hippocampus, amygdala, and prefrontal cortex. Regular use is linked to an increased risk of psychotic symptoms. Marijuana is linked to increased psychotic symptoms (e.g., delusions, hallucinations, disordered thinking) however it is difficult to sow whether causation is at play, and which way the connection goes. Marijuana is linked to lower educational attainment. When pot smoking begins in adolescence, people tend to go less far in school. Again, causation is hard to prove. Marijuana may (or may not be) be a gateway drug. Regular teenage marijuana users are more likely to use other drugs in the future – but again, researchers don’t know whether the link is causal. Marijuana is probably (but mildly) linked to schizophrenia. Studies have shown that marijuana is connected to a doubled risk of a schizophrenia diagnosis in the future. On the upside, they point out that users who quit using the drug after a first psychotic episode have fewer psychotic symptoms and better social functioning moving forward, compared to people who have a psychotic episode but continue using. Marijuana may be linked to testicular cancer. Its connection to other forms of cancer is not very consistent, but there’s some evidence of an increased risk of testicular cancer in long-term marijuana users. Look, the chronic effects of marijuana may seem to be clearing up, however there is a lot of work that still needs to be carried out and far more studies need to be done to validate or vindicate the use of marijuana. What is clear, however, is that like with so many things on this planet, abuse can lead to addiction. This is where we step in. Some regular users of marijuana will argue that dope is not as addictive as other drugs and that use does not lead to physical or psychological dependence. 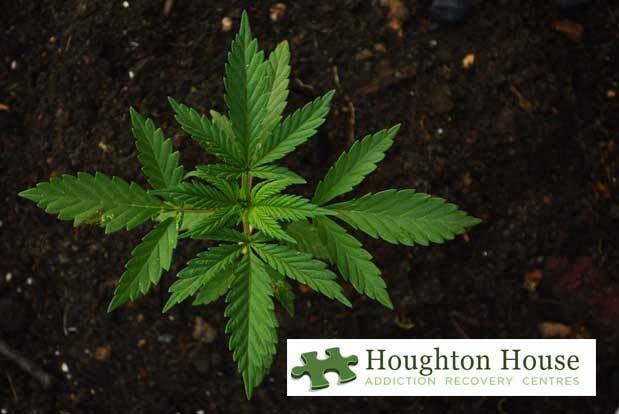 The contrary however has been proved and it is widely accepted that the plant is indeed addictive and can produce physical and psychological dependence. In addition, users have shown an increased tolerance to the drug, which means that have consume more of it to get the same results, a tell-tale sign of addiction. Marijuana, like any substance can quickly become addictive. The first step to recovering from an addiction is recognizing that you have a problem. Be it alcohol, gambling or in this case, marijuana. Remember, just because something is made legal does not make it non addictive. Realising that you may be addicted to marijuana may nip the addiction in the bud. Here are 10 signs of addiction to marijuana which, if you recognise in yourself or a loved one, may prove that an addiction to marijuana could be present. Like any drug, regular use of marijuana leads to a tolerance for it. You will need more of the drug in order to achieve the same high. If you experience withdrawal symptoms or tolerance you could be addicted to marijuana. 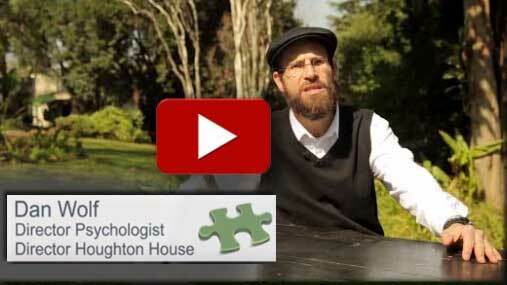 Signs of withdrawal include loss of appetite, irritability, insomnia or anxiety. You may start out saying to yourself “I’m just going to have a few hits.” But end up smoking the whole joint. If this happens often it’s a sign of addiction. What you do with your time speaks volumes about you. If you spend most of your day and night getting high, wanting to get high or looking for marijuana it’s a big red warning sign. If your calendar of events and activities has slowly been wiped clean and replaced with hanging out with mates to get high, you are sacrificing your real self for the addicted self and may be addicted to marijuana. One thing addiction does which is obvious to others is change the way you conduct yourself in social situations, particularly work. Often this behaviour can be in contraction of set rules and regulations set up for that place. For example: You have been warned not to arrive late for work or go to work high on dope, but you continue anyway, you are basically committing self-sabotage and that is a sure sign of addiction. Escaping life’s problems with a joint. If you think you can only deal with bad grades, stress, relationship problems and other issues by getting high, you are relying on the drug to separate you from the real world and that is a key sign of addiction. Can’t be creative without getting high first? Need a joint to unwind and feel relaxed? You could be addicted to marijuana if you need it first to continue with tasks such as being creative or wanting to simply relax. Can I still use marijuana if I choose this? If you base the choice of events and who you want to hang out with based on whether or not you can use dope or if you can get high, you are using the drug as a standard for decision making, and that is a sign of addiction. If you start to consistently fail to complete your daily tasks and responsibilities because your mind is focussed on getting high on dope, it might be a motivation problem OR it could just as easily mean you have a psychological addiction to marijuana. Marijuana is now legal to use in a personal capacity in South Africa. This does not change the fact that like any other thing that humans use, it can be abused and lead to addiction. 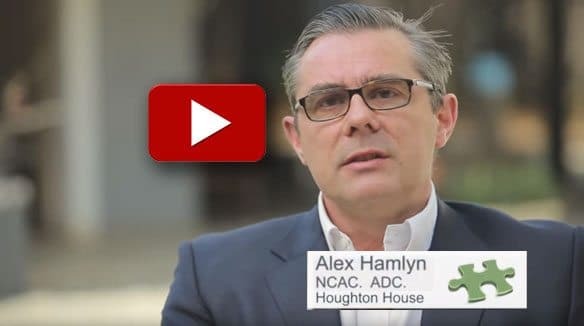 It may not be considered by the average person as serious as other drug addictions, like heroin or crack cocaine, but the effects are still serious enough that some people require help getting through withdrawal and rehabilitation. Worldwide the decriminalisation and legality of Dagga for health and pleasure use varies by country, in terms of its ownership, delivery, and crop growing, and how it can be taken or consumed for differing medical conditions is different across the world. Policies in most countries are directly related and held by the United Nations Single Convention on Narcotic Drugs that is from 1961, and the 1971 Convention on Psychotropic Substances and 1988 Convention against Illicit Traffic in Narcotic Drugs and Psychotropic Substances. 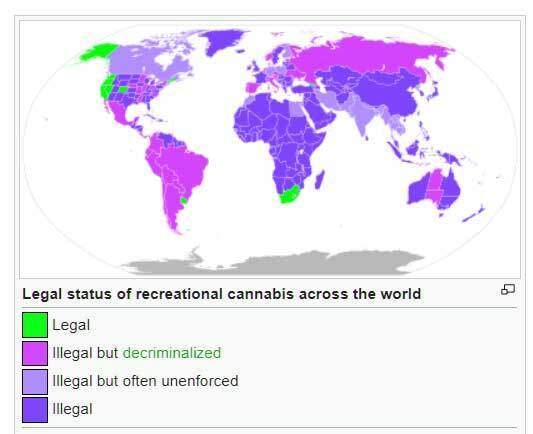 The use of marijuana/ Dope/ Dagga recreationally is prohibited in most countries; see map Many have adopted drug policies of decriminalization to make possession of self-use amounts a non-criminal offence similar to a minor traffic violation. Other countries have much more severe penalties like certain Asian, North Korea and Middle Eastern countries where ownership of even small amounts can be punished by imprisonment for several years and other drugs remain illegal and have the death penalty attached. Countries that have legalized recreational cannabis are Canada, Georgia, South Africa, and Uruguay, along with nine states in the United States as well as the District of Columbia. Though it seems a policy of partial prosecution has also been adopted in many nations, in particular, Spain and the Netherlands where the sale of marijuana is tolerated at licensed shops. As far as the medical use of marijuana is concerned countries that have legalized it are Australia, Canada, Chile, Colombia, Germany, Greece, Israel, Italy, the Netherlands, Peru, Poland, and the United Kingdom. More constricting laws permit the use of certain marijuana-derived drugs, such as Sativex or Marinol. In the United States, 31 states and the District of Columbia have legalized the medical use of marijuana, but at the federal level, its use remains prohibited for any purpose. Marijuana is now legal to use in a personal capacity in South Africa The reason behind the decriminalisation of marijuana? The ban was in contradiction to its constitution. But what does this mean to us?